Nov. 28, 2018: Bronxville Elementary School fourth-graders, who have been conducting extensive research about the various aspects of the lives and culture of the Iroquois and Algonquin nations, collaborated in groups to construct their own models of Native American dwellings. Before starting the building process, the students learned about the two nations' traditions and beliefs, food production, farming needs and tools, and technology, as well as the work specialization and the roles of men, women, and children in their society. They also compared and contrasted the patterns of organization and governance of the Native American groups and investigated how each nation adapted to and modified its environment to meet its needs and wants. To gain further insight into the lives of the first people of New York, the students visited Ward Pound Ridge Reservation, where they went inside a wigwam and explored the various tools, weapons, and toys that the Native Americans of this region would have used. 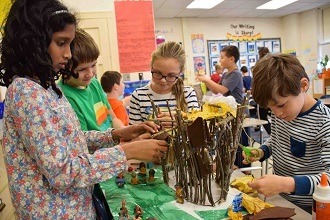 Afterward, the students constructed their dwellings out of wooden sticks, leaves, and felt and created figures and sculptures out of clay to represent the culture and society of the Iroquois and Algonquin nations. Throughout the project, which was part of a project-based learning unit, the students learned how to collaborate with their peers and develop a compromise, as well as set team and individual goals. To conclude their project, the students were challenged to consider one of two actual events that affected the lives of Native Americans and to reflect on their built environment to consider the implications. They also reflected on how Native American life was changed as a result of European exploration. 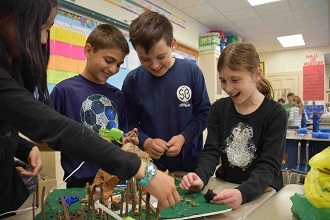 Pictured here: Bronxville Elementary School fourth-graders collaborated in groups to construct their own models of Native American dwellings.